Most applications will give you the option to work in either CMYK or RGB color mode. It is fine to begin working in RGB, there are some filters in Photoshop that are only available when working in RGB mode. Just remember to convert to RGB before submitting your images to us. Keep in mind that it red, green and blue light create more colors than cyan, magenta, yellow and black inks do. Therefore, your image may look a little different in RGB than in CMYK. If we must do the conversion here, we are not responsible if you are not happy with the conversion results. Please save all bitmap images (like those out of Photoshop) in either tiff or eps format if you will place them in a layout program. If it is for final printing, tiff, eps or jpg with maximum quality format is acceptable. we cannot print gif, pict, dcs, ping, psd, cds, etc. formats. Please do not save your images with LZW compression. Placing an unacceptable format in an acceptable format does not make it useable. These three photographic expressions may sound like either an economic report or an animated studio, but the truth is each element can tell you something different about your photo, your camera and what to expect from your finished product. DPI – This stands for “dots per inch” and essentially helps you understand how detailed your picture will be. If you print at 600 dpi you will have a very clear print, but the size of the print may be smaller than you like. By reducing the dpi to 300 you will produce a larger sized photo with minimal loss in clarity. If you need an even larger print you can also print at 200, 150 or even 100dpi, but you will also add to the overall loss in quality. This is why the 75 dpi found in most online photos makes them nearly impossible to use for any print application such as the production of a Photo Puzzle. Ppi – This stands for “pixels per inch” and generally coincides with dpi (dots per inch). While this doesn’t signify the number of dots in printing it does signify the number of photo information elements used in a print. Pixels – This is the smallest measurement of a digital image. Each pixel contains information that will help reconstruct a photo. The more pixels used – the more clarity the picture will have. Standard cameras generally have 6 megapixels (6 million pixels) or less. 4-6 megapixels is often enough to create a pleasing result for one of our jigsaw puzzles. Experience has taught us that, more often than not, when people send native application files, they forget fonts and placed images, forget to convert images to RGB color, include spot colors, use low-res images, and make other assorted errors. Some reports conclude that 78% of files sent to printers are not ready to go to print without some kind of fix required. To eliminate fixes and ensure quality and fast delivery, the best way to send files is in TIFF, JPG, PDF or EPS format. Done correctly, these formats eliminate the need for you to upload fonts or images used in your files, and also decreases your upload time. See the information following for specifications on how to save files for different applications. If your files are not prepared properly, fonts or images are missing, or your files need any significant repair work in order to be printed, your order will be put on hold. We will contact you with the option to re-submit files or give you an estimate of charges to let us correct your files. When sending native application files, you must also include all fonts you used to create the document, as well as all the images you placed in the document. We do not recommend embeding images, it increases file size, and if there is something wrong with the image, (i.e. is rgb, not cmyk) we cannot quickly fix the image and update it. Never copy and paste images into a document from your clipboard. Fill solid black areas with a “Rich Black” rather than black only. Rich Black is made up of 30% Cyan, 30% Magenta, 30% Yellow, and 100% Black. This will keep solid black areas from looking gray, and should be used for larger solid areas or heavy type over 36 point. 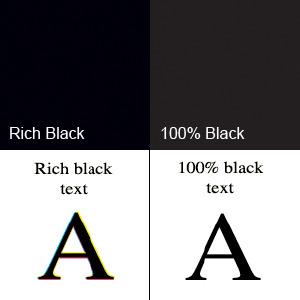 For normal body text, use 100% black, do not use Rich Black. Do not use 90-100% of each color to create a rich black. This will cause problems on the press due to too much ink getting put down in one spot. While we own and use an extensive list of applications, we cannot be expected to own or know the intracacies of each one. If you are using any programs other than those listed as supported above, you must check your documentation for how to save or export your files to tiff, eps, hi-resolution jpg, or hi-resolution pdf format. Whenever possible, convert all text/type in your documents to paths or outlines, eliminating the need to send fonts you used with your files. This is easily done in programs like Illustrator, FreeHand and CorelDraw. When using Photoshop, flatten files before submitting, which automatically rasterizes all fonts used. While we have an extensive font library, we canot be expected to have every font or version that is out there. JPG/Jpeg—Great for photographic images on the web, because it compresses the file (makes it smaller). Not ideal for printing, because every time you save it, you lose more color and detail. JPEG files can be printed at 300dpi at or smaller than 100% of image size at that resolution, but CANNOT be enlarged without losing sharpness. TIF/Tiff—Great for photographic images for printing. TIFF files can compress using the LZW compression algorithm without loss of color or detail. TIFF files can be printed at 300dpi at or smaller than 100% of image size at that resolution, but CANNOT be enlarged without losing sharpness. EPS (Vector)—The vector type of EPS file—created in Adobe Illustrator® or Macromedia Freehand®—are the best for logos because the image is made up of shapes that are defined mathematically—when they are printed, the printing device creates them on-the-fly at whatever size and resolution is needed, as big as a building, as big as a planet.Vector EPS files CAN be printed at ANY size without losing sharpness UNLESS they have photographic images embedded in them. EPS (Continuous Tone)—There is a continuous tone type of EPS created in Adobe Photoshop® to save photographic images with special effects. The photographic parts of the file continue to act just like a .tiff file (see above).Continuous tone EPS files can be printed at 300dpi at or smaller than 100% of image size at that resolution, but CANNOT be enlarged without losing sharpness, because the image is not just made of mathematically-defined shapes. Saving a continuous tone image in EPS format does NOT make it infinitely scalable like a vector file. GIF—Great- for saving graphics with large blocks of solid color to very small file sizes for the Web. Sometimes works well for photographic images on the Web as well.Gif files must be converted to 300dpi CMYK .tiff files for printing, and once this is done can be printed at or smaller than 100% of image size, but CANNOT be enlarged without losing sharpness.GIF colors are also not continuous tone, so will appear posterized when printed. Avoid printing from GIF files if at all possible, as they are rarely high enough resolution to be used that way. PNG— A raster file type developed by Microsoft® for use in Microsoft Office®. PNG files are rarely of high enough resolution to be printed from, are not continuous tone so will appear posterized, and are in Indexed color space so will need to be converted to CMYK .tiff format for printing. WMF— A vector file type developed by Microsoft® for use in Microsoft Office®. Allows scaleable graphics to be imported into Word. While WMF files are vector files similar to Illustrator files, they don’t allow for curved vectors. Curved lines will be converted to short, straight lines, distorting the graphic. If you are going to use WMFs, particularly if there is type involved, make them several times larger than you are going to use them. They are also saved in RGB color space, so will have to be converted to CMYK .tiff files before printing. The number of colors you can see in a given pixel is determined by the bit depth that has been captured, the bit depth that can be processed and the bit depth that can be displayed. Generally you want more in all cases, but the size of the files go up exponentially as bit depth increases, and the speed at which those files can be manipulated and displayed are determined by that size. Bit depth is used differently and acts differently depending on where it is being used; how it it is used in a monitor isn’t necessarily how it is used in Photoshop. A byte is made up of 8 bits. A byte holds the equivalent of a single character, such as the letter A, a dollar sign or decimal point. For numbers, a byte can hold a single decimal digit (0 to 9), a number from 0 to 255 (binary numbers), or a single level of grey. 16-bit HighColor (32 levels red × 64 levels green × 32 levels blue) 65,536 colors; more colors generally dithered from these. Bit depth increased as processing power increased. Everything below 24-bit color is only a rough interpretation of actual color, requiring a lookup table that renders the closest approximate color. 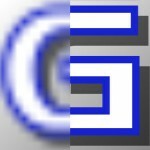 A standard pixel in an 8-bit channel RGB Photoshop file is made up of 3 bytes of data: 1 red byte, one green byte, and one blue byte (in other words, 256 levels of grey in each of the Red, Green and Blue (RGB) channels). Sometimes that is not enough; black and white images scanned to an 8-bit greyscale channel often look posterized, and extensive image manipulation of 8-bit-per-channel color images can result in color banding. Scan black & white images at 32-bit or higher, and create igher bit-depth files if the files will be manipulated a lot. We serve Fort Lauderdale, Miami-Dade, west Palm Beach, Miami Beach, south Florida and all 50 states.